The easy Halloween party recipes I've chosen below will help to make your next Halloween celebration a complete success. Your guests will love the taste of these festive dishes that are perfect for serving at this season of the year. Whether it's Halloween, Thanksgiving Day, or a football weekend, these creative party dishes are sure to be appreciated. Combine crushed wafer crumbs and butter. Press crumb mixture into bottom of and sides of your greased spring-form pan to form your cheesecake crust. In a large mixing bowl beat cream cheese and sugars until creamy smooth. Add in the eggs and beat on low speed. Whisk in the pumpkin, cornstarch, vanilla, and pumpkin pie spice (a.k.a. your secret ingredient). Pour mixture into crust and bake at 350°F for 1 hour. Cool for 10 minutes or so before doing anything else to the cheesecake, but don't turn off the oven just yet. Mix up the topping ingredients and spread this over top of the filling. Return cheesecake to oven for 6 minutes to melt. Carefully run a butter knife around the edge of the pan first to loosen the crust to make release easier later on. Allow to cool to room temperature and refrigerate overnight. In the morning, remove the spring-form sides, pipe on spider web decorations, and place a candy spider in each little web (try to space them so that each slice has a spider). Pipe small spiders from brown or black icing if candy spiders are unavailable; tiny strips of black licorice can be cut and used for the legs. Helpful Hint: You can slice the cheesecake before decorating, if you want to make all the decorated pieces appear even. Combine gelatin and orange juice and let stand for 5 minutes. Heat milk until boiling and add to gelatin. Transfer mixture to blender and blend until well blended. Add cream cheese, sugar, vanilla, orange peel, and blend again. Drain oranges, reserving the juice in a small dish. Add pineapple and reserved orange juice to gelatin mixture and blend again. Fold in the whipped topping. Divide half the oranges into 8 dessert dishes. Layer with half the gelatin mix and half the cracker crumbs. Repeat gelatin, crumbs, and top with mandarin oranges. Refrigerate for at least 4 hours. 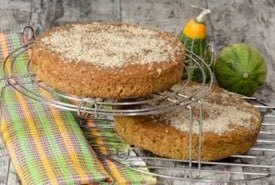 Before serving, sprinkle with more crumbs and maybe a large dollop of whipped cream topping and a Halloween candy on top. This recipe for party mix is also great for serving at fall football parties and Thanksgiving Day celebrations. The best part about this easy Halloween party recipe is that you can make it in a crock pot, leaving the oven free for making other dishes. Set the crock pot to low heat. Mix up the cereals, pretzels, and peanuts, and put in the crock pot. Combine butter, parmesan cheese, and salts; drizzle over the dry mixture and toss for coating. Put the lid on the crock pot and cook on low for 3 to 4 hours. Stir at least once each hour to avoid burning the mix and to ensure it all cooks evenly. Simply combine all ingredients and chill for at least one hour before serving. This dip is perfect in the center of your veggie tray. To make the serving table appear extra festive for Halloween night, scoop the dip into a small hollowed-out mini pumpkin or squash for serving. Besides veggies, use Halloween-shaped cookie cutters to cut mini finger sandwiches and use the dip as a spread on those. Delicious. Make marshmallow treats the regular way. Melt butter in 3-quart saucepan, add marshmallows and cook on low heat while stirring constantly until blended. 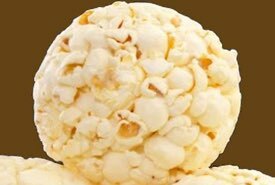 Remove from heat and stir in vanilla flavoring and food coloring, then add Rice Krispies® and stir well until coated. Lightly press mixture into buttered 9 x 13 inch pan and cut into squares when cool. Add a candy corn or one of your favorite chewable Halloween candies to the top of each square to decorate. Yields about two dozen 2-inch squares. Did you know that the original recipe for Rice Krispies Treats® first appeared on the Rice Krispies® cereal box back in 1940? The famous recipe was actually invented in 1939 by Mary Barber and the staff at Kellogg's®, and there's now many variations. Replace the rice cereal with corn flake cereal and omit the orange food coloring. Follow the instructions combining the melted marshmallow and butter mixture with the cereal. When cool enough to touch, mold the cereal mixture into the shape of haystacks and place on a buttered cookie sheet to cool thoroughly. Add a candy corn or an orange-colored pumpkin candy to the top of each haystack to decorate. This easy Halloween party recipe blends orange juice, milk, sherbert and bananas together until very smooth. Pour into fancy glasses. Add a ghost-like dollop of whipped cream on top of each drink just before serving, and use chocolate chips for the eyes. Here's an easy pumpkin seed recipe to make a tasty all-natural snack that you'll enjoy eating any time. 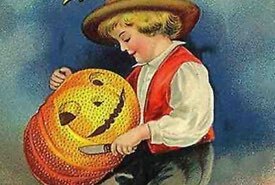 It doesn't feel like Halloween until you've sunk your hands into a ripe pumpkin to pull out all the icky, gooey insides to carve your jack-o-lantern. Now that you've got that pile of pumpkin seeds sitting there, what do you do with them? Don't just toss them in the compost! Roast them in the oven for an old fashioned treat first made popular back in Grandma's day. Pumpkin seeds that have been salted and roasted to perfection are absolutely delicious. First, rinse the pumpkin seeds under cold running water and try to remove all the pulp and pulpy strings. Place the wet seeds on a tea towel (or paper towels) and pat to remove excess water. Oil a baking sheet with your favorite cooking oil and spread the seeds evenly on the sheet. Sprinkle seeds with salt to taste; you might find yourself using a little more salt than usual. Bake at 325°F until toasted for 15 minutes. Stir and flip the seeds over so they'll bake on both sides. Bake at 325°F until toasted for another 15 minutes. Let the seeds cool off completely before eating. The pumpkin seed mix can be stored in an airtight container for serving later. 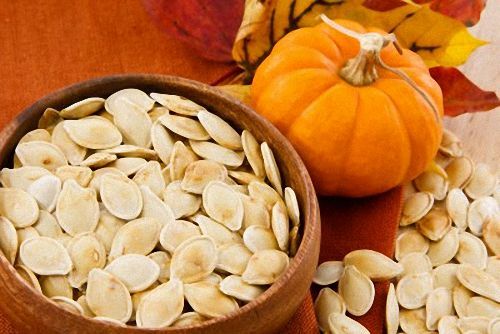 If you prefer your seeds with a saltier flavor, you can soak your pumpkin seeds overnight in salty water. It won't make a huge difference in the taste, but some people prefer doing it that way. Almost any popcorn seasoning can be used with good results. Use this Halloween party recipe to make delicious sundaes for your guests. Into each cupful of partially thawed vanilla ice cream, mix in one tablespoon of candy corn (coarsely chopped) and one tablespoon of dry roasted peanuts or cashews (coarsely chopped). Scoop into individual ice cream bowls and freeze until firm. When ready to serve, drizzle caramel ice cream topping over the ice cream mixture, add a dollop of whipped cream, and some additional candy corn and chopped nuts sprinkled over the top. Marshmallow ice cream topping can be used instead of caramel, if preferred. Several recipes call for "candy corn" either as an ingredient in the recipe or for use as a decoration. It's a popular Halloween candy sold in North America around Halloween time. 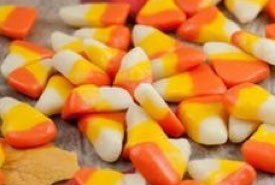 If you cannot find it in stores or if it's not sold in your country, you can always make it yourself using the homemade candy corn recipe given on this website. Bookmark this page to keep handy. You'll love serving the delicious Halloween desserts and snacks to your guests. 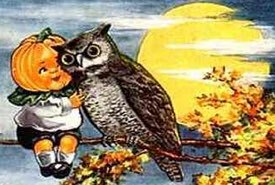 Just imagine their reaction to the tasty veggie dip in its decorative hollowed-out pumpkin shell, the colorful orange parfait, or the luscious pumpkin cheesecake that's to die for. Give these easy Halloween party recipes a try. They're perfect for any fall get-together, including Thanksgiving. But, be sure to make lots of snacks so you won't run out. Your guests will rave about your party food, and they are sure to ask for seconds.